As a dealer who has to compete with big box stores and the Internet, creating the best possible experience has never been more important. 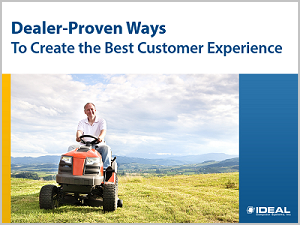 Here are 7 proven ways to create the best customer experience and breed customer loyalty into your dealership. We all know that first impressions can mean everything. That’s why it’s critical that the overall look and feel of your dealership is presented in the best way possible. This means having a very clean and organized business. As challenging as it can be with all of the dirt and equipment that comes through your doors, you need to make a conscious effort to keep your floors, product shelves, and counters clean. Organize products so they are all facing the consumer and are appealing to the eye. If you have stools at your counter with tears or duct tape on them, get rid of them and replace them with new ones that are inviting to sit on. It’s essential that you create an environment where anyone would be comfortable sending any member of their family into your dealership to do business with you. This is an area that Bob Clements, dealership consultant and president of Bob Clements International, highly stresses to his clients. You must have labels on every item of merchandise. If there’s no label, it indicates it’s not for sale. Make sure you avoid hand-written labels. If it’s hand-written, it implies that the price is negotiable. Check with your manufacturer reps to see if you can get professional-quality pricing labels for your merchandise. If you use industry-specific business management software, check with your provider to see what kind of options they offer for printing professional-quality labels directly from your system.